Spoiler warning: The action in LIFETIME starts immediately after the events depicted in LAST WILL and there are lots of connections here to events from the earlier novel so this review will undoubtedly act as a spoiler for the previous book. You’ve been warned! Annika Bengtzon’s life is in disarray as the book opens. The previous night her husband left her to (as my mother would put it) ‘shack up’ with his mistress and a few hours later her house caught fire while she and her two children were still inside. They do escape but do not manage to salvage a single item from the house and the final misery comes when her best friend refuses the bedraggled family a place to stay. The sorting out of this mess acts as a backdrop to the main events of the novel which focus on the death of a celebrated policeman David Lindholm. He was found by fellow officers dead in his apartment and his wife Julia, also in the police force, appears to be guilty. Her service weapon was used to kill David and she can provide no coherent explanation for what happened. Even more worryingly she cannot say where the couple’s four year-old son is. Most of the police force agree that David Lindholm was a hero and that his wife should be locked up forever for his murder, and they soon come to believe she also killed their son. Even Julia’s best friend, Nina Hoffman, finds it difficult to maintain a belief in her friend’s innocence. Annika becomes involved with the story because she remembers spending a night on patrol with Julia and Nina some years earlier for a story she was writing and she contacts Nina for an interesting angle. She becomes increasingly involved, especially when learning that the public plaudits for David Lindholm do not represent the whole truth about the man. Sometimes it’s hard to like Annika Bengtzon but I have no trouble loving her as a character. She is such a realistic person with her jumbled mixture of good and bad qualities that I can’t help but be compelled by her and here I felt sorrier for her than I’ve ever done before. Not only does she have lousy taste in men but her choice of best friend proved poorly judged too. But Annika is nothing if not resilient and she gets on with the business of investigative journalism even while she’s screaming at bank clerks to find her a way to get access to her money without proof of identity, being under suspicion of setting the fire which burned down her house and overdosing on ‘bad mother guilt’. The scene in the book where has to take her kids to an interview with a social worker at a centre for drug addicts has stuck in my mind as the perfect example of the way Marklund depicts all aspects of Annika’s life so very credibly. As always though, the book offers much more than Annika’s domestic woes and a crime to solve. Marklund continues her exploration of the way modern media and journalism is coping (or not) with the enormous changes in the industry in recent years and this has become one of my favourite aspects of the novels. There is also more insight into the workings of a modern government as, partly through Annika’s husband Thomas’ work, the novel explores the concept of life sentences in the justice system in a thought-provoking way. In fact the only sour note of the whole reading experience is that I really didn’t swallow the resolution to the thread of Annika’s house being burned down. I can’t say why without spoiling the ending but I just thought she was way too blasé about this to be really credible. I’ve always read my Marklund books in print before but I happened to see this one available at Audible so I listened to it instead. The narration by India Fisher was terrific and I really enjoyed reading the book with my ears instead of my eyes. To round out the trilogy of named contributors to this book the translation by Neil Smith was, as always, the kind that makes me forget it was first written in another language. 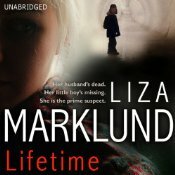 If you’re a fan of Liza Marklund’s books then you probably don’t need much encouragement to read LIFETIME but if you were wavering: don’t. It’s a fabulous addition to the series. If you’re new to Marklund’s work I’m not sure I’d start here simply because there are so many connections to the previous novel so you should probably start with Petrona Award winning LAST WILL. This entry was posted in book review, Liza Marklund, Sweden. Bookmark the permalink. I’ve just finished reading ‘Exposed’ the first Liza Marklund book I’ve read. Enjoyed it, but it had a couple of twists at the end that were not needed, one of which was obviously about complicating Annika’s life, even though it was already pretty messed up! Sounds like it continues in a topsy-turvy fashion. I like your review, but will hold off for now. I’ve not tried the author before and have more on TBR that I can sensibly get to just yet, cheers. Your entry has just remind me not to forget I should read it soon, Bernadette. Great review Bernadette of a great book. This series is going from strength to strength. Glad to see that you thoroughly enjoyed the book, burned-down house resolution notwithstanding. I’ve had this book on reserve at the library, and as soon as my turn comes up, I’ll get it and just dive right into it.